The best fruit in the world. Not related in any way to the mango. Because a good writing day is better than all the mangosteens in the world. Because a good writing day wipes the memory of all those bad writing days entirely. Because I love it. I don’t think about it like that, honest . . . Interviews hurt my brain. Being asked to talk about my work in the abstract feels weird. Especially when I’m asked about what message I wished to convey, what I want to teach people, how I want to change the world, and why did I have this bit of my book symbolise x, y, or z. The truth is I don’t think about any of that stuff when I’m writing a first draft. Nothing in any of my books is meant to symbolise anything. As far as I’m concerned my zombies are just zombies. I don’t set out to teach anyone anything and I have no overt messages to convey. But I didn’t do that on purpose. Truly. I don’t write like that. I know writers who do, though. A friend of my carefully plans all sorts of symbols and always talks about the message of their book. Not me, though. I just had to answer a set of questions from the members of the Teen Advisory Group of the Kingsbridge Branch Library in the Bronx via their Young Adult Librarian, Andrea Lipinski. Their questions were awesome. There was nothing about metaphors or meanings or messages. Bless you all! They wanted to know if I believe in magic, whether I like Sydney or NYC better, who I think is the better writer me or Scott, whether my trilogy’s going to have a fourth book, and which of my characters is most like me. Someone just told me I’m wrong about Bring It On being the best movie of all time. Excuse me? If I say it is then it is! This is my personal list of the best movies of all time. I cannot be wrong about it. I’m not saying there aren’t other best movies of all time. There are! The Princess Bride is one. Rififi is another. Not to mention Out of the Past and Lagaan. I am also not wrong about mangosteens being the best fruit. Or The Wire being the best television. Or Emma and Hellsing and anything by Osamu Tezuka being the best manga. Or zombies being the best monsters. And cricket absolutely is the best sport. Though, of course, I reserve the right to tell you that your choices of best movie etc of all time is completely wrong. Because I am blog overlord. Thanks so much for all the warm yummy wishes. I’m bubbly and bouncing! Q: Will it be in hardcover or paperback? A: Hardcover first and then later (don’t know how much later) paperback. Q: Penni asked: Are you signing a contract for a book you haven’t written yet? A: It’s like this: Bloomsbury have bought two books from me, the already-written UFB + an unwritten second book. Yes, that means I’ll be writing one novel of the contract to deadline. I know I said I wouldn’t do that anymore. But the writing-a-book-at-my-own-pace thing (which resulted in the UFB) was an experiment. I think I’m ready to tackle novel to deadline once again. Especially as I’ll have oodles of time and have already started a new novel. Plus Bloomsbury wanting a second book shows that they as a company are committed to me as a writer, which makes me feel warm and bubbly. Q: Dess asked: Is there a difference between fairies and faeries? A: There is. While as Diana pointed out they all have the same etymological root, in modern fantasy using “faerie” usually means the story will be influenced by Celtic or English mythology. There are lots of ballads that deal with the faerie folk. Those are a big influence on Holly Black’s work for instance. Her faerie are darker and scarier than mine. Also mine are invisible and not influenced by the Celtic or English traditions at all. Q: Are there mangosteens and cricket matches and Elvis and monkey-knife fights in it? Q: Is it set in Australia? Q: Why did you leave your old publisher? A: I had a three-book deal with Penguin/Razorbill for the Magic or Madness trilogy. So my contract with them was done. My new book is so completely different from the trilogy that it seemed a good time to find the best possible match for it. My agent and I both agree Bloomsbury are a wonderful home for the UFB. Q: Maggie asked: Are ultimate fairies anything like extreme fairies? This morning at brunch we were subjected to dread awful music played too loudly.1 A whole CD’s worth. I affirmed that I had not and was grateful that was the case. He continued to doubt me, asserting that the band had been huge in the eighties, and unless I grew up under a rock I could not have avoided hearing them. We asked one of the waitrons who told us it was Foreigner Journey. She also expressed amazement that i did not know the band. “She’s Australian,” Scott pointed out. “So you like Abba then,” she said. It wasn’t a question. “I hate Abba,” she said. “You’ve really never heard Journey or Foreigner or Toto or Kansas before?” Scott asked. So, my Aussie readers, is my lack of knowledge of those one-word American bands from the eighties an aberration? Am I the only Aussie who doesn’t know them? I’ve never listened to commercial radio. Maybe while I was listening to Triple J and 2SER and the other ABC radio stations, those bands were on high rotation on 2SM or 2MMM or somewhere like that. But I did watch Countdown and don’t remember seeing those bands there either. And I just flipped around these charts and couldn’t see them listed anywhere. But I was pretty cursory about it. Do you Aussies know these bands? Were they as popular back home as they were here in the US of A? Seriously, everyone in the restaurants was playing air guitar and mouthing the lyrics. It was terrifying! 1) Be very very rich and fly first class. On those rare occasions I’ve been upgraded to business class I’ve recovered from jetlag many days earlier than when I fly cattle class. I can only imagine how much faster the whole thing would be in first class. Or in your own private jet. Or if you could teleport. I would not say no to a door between Sydney and New York either . . .
2) Don’t fly anywhere. You get no jetlag and the environment will thank you. Little Willow asks what my favourite fruits are and gets extra points for being an American and spelling “favourite” correctly. I may possibly have mentioned my love for mangosteens. I am also dead fond of mangoes (I read this wonderful novel recently that featured a character eating a mango for the first time without knowing what it was), pineapples, rambutan, figs, longan, lychees, dates, custard apples (I just realised I haven’t eaten one in at least two years. Crap. That’s what I get for missing Sydney winters), apples (when they’re crisp and not even slightly floury), grapes (especially champagne grapes), nectarines, sugar bananas, peaches, passionfruit, dragonfruit, these amazing brown fruit I had in Thailand that I can’t remember the name of sapodillas, cherries, strawberries, raspberries, blueberries, blackberries, mullberries, boysenberries, cape gooseberries and apricots. I’m sure there’s some others that I just can’t think of right now. It’s much easier to say which fruits I’m not in love with: paw paw and grapefruit, but if there’s no other fruit going I’ll eat them. I just won’t melt with joy as I do so. If I could only live off one food group I’d go the fruit and veg with major emphasis on the fruit part. I loves them. Anyone who does not love fruit is deeply weird and suspect. book signing etiquette. ex. 1: is it a bad idea to bring every book the author has ever written, even if they’ve written, like, 20? is it okay for book signees to start conversations with the author, or will that be considered rude for holding up the line? It’s entirely dependent on how long the queue is. If it’s short then most authors will be grateful to you for showing up at all. When they see you have all their books they may cry. Authors with teeny tiny signing queues are more likely to start a conversation with you than the other way round. They may not let you go at all. The thought of the queue going from miniscule to non-existent is too frightening for them. If this happens to you, smile politely, ask them questions, and as soon as another of the writer’s fans shows up, back away slowly and make good your escape. I have no advice for you if no other fan shows up. It may get tricky and involve staging a diversion. I imagine Maureen Johnson would have some excellent suggestions, but I fear they would involve a stun gun. If the line is very very very long then they’ll probably have a limit on how many books you can sign, and the author may be too ecstatic with joy at the size of their queue to be capable of coherent conversation. But I can only surmise. I have never had a queue of unusual length (QOUL). It’s something I aspire to, like having my name bigger than the title on my books. Some day . . . Since some of you have been asking here’s a wee bit about our current Bangkok adventure. We’re staying at Siri Sathorn in downtown Bangkok. It’s a serviced residence which means it’s like a hotel, but instead of rooms there are proper flats with kitchen and everything. Not that we’re doing any cooking—the room service here is awesome. Though even if it wasn’t Bangkok is full of incredible restaurants and food stalls. There’s fab food literally everywhere you go. 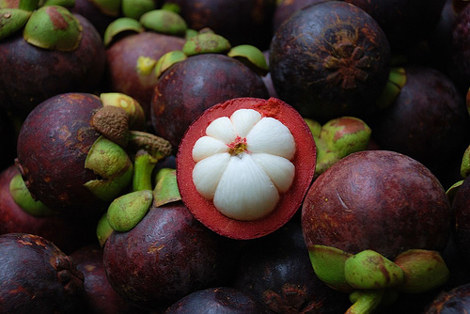 Yes, I have eaten some mangosteens, though they were sadly not the best. To be expected given that the season ended last month and they’re best when really fresh. Don’t be too sad for me though cause I still get to gorge myself on very fresh and yummy longan, dragon fruit, pineapple and mangoes. Yup, I know, life is harsh. We’re not near Khao Sahn Road. Back-packing districts are typically not conducive to getting writing done. Where we are is dead quiet and peaceful, though that’s mostly because we’re on the twelfth floor . . The views are extensive! We’re not near the river either. All part of keeping distractions to the minimum. In fact, we’ve done very little sightseeing thus far. Just walked around a bit at night on our way to dinner. We’ll probably do more exploring once we’ve got our writing rhythm going. Which is what we’re here to do: write. I’m working on the Great Australian, Elvis, Mangosteen, Monkey Knife-fighting, Cricket, Fairy, YA Novel. Indeed, I plan to finish the first draft while here. Scott is working on . . . actually, I think what he’s working on is a secret. I’d ask him but he has his intense don’t-even-ask-me for-a-synonym-for-“effulgent” writing face on. Hmm, that face makes me feel guilty. I shall return to my monkey knife-fighting fairies! Thanks for all the well wishes. Lovely to hear from so many of you that you enjoyed the first two chapters of Magic’s Child! which I swiped from dunnowhere ages ago stupidly forgetting to get the photographer’s name. Whoever took this: it’s Â© you. We’re in Glasgow. It’s gorgeous and fun and you just can’t get bored by Charles Rennie Mackintosh. London: great (though bloody expensive) food (Niki and Lauren & Andrew have been most excellent guides), brilliant markets, cheap clothes (bought the most gorgeous 15 pound skirt). It’s not the city I remember, though I did get some awe-inspiring rudeness—so it hasn’t completely changed. Best restaurant was David Thompson’s Thai one in Soho (I forget the name). Thompson’s Australia’s guru of Thai food. Was wonderful watching Lauren and Andrew’s delight in finally trying decent Thai food. I also gave them their very first mangosteens. Heavenly! Glasgow: gorgeous, love all the Rennie Mackintosh everywhere. Had the most brilliant black pud and organic cider at Cafe Gandolfi. Cider in the UK is the best I’ve had in my entire life. Superb. And tonight WorldCon begins. In the meantime the second test is on the tellie and Warne is bowling beautiful. Yup. Magic or Madness just notched up its fifth sale, this time to Amarin Printing and Publishing in Thailand. My foreign rights agent, Whitney Lee, is amazing, having now sold my book in Taiwan, France and Thailand (the other two sales were to the US and Australia). I’m particularly exited because this is the first non-English language sale where I’ve actually been to the country. I adore Thailand. I love the sound and look of the language (Thai script is just gorgeous), the food (tamarind, mangosteens, steamed salty duck eggs, miang gung, snake beans, fish cakes, green mango salad, banana blossoms, massaman curry, kaffir limes, chilli jam, I could go on and on and on), the incredible art, both ancient and contemporary. It’s one of the most amazing countries I’ve ever visited and, what’s more, like Taiwan, it’s in my part of the world. Not nearly so remote as France. Thailand is a country I grew up knowing about. A neighbour. Some of the kids at school were from Thailand or had parents or grandparents from there. And now my book’s going to be available in Thai in Thailand. Yay! The sale also made me wonder how Thailand is doing in the wake of the tsunami. It’s been two six months now, yet I rarely see any articles about the situation in all those countries where thousands died and millions lost their homes. Funny how quickly catastrophic events disappear from the headlines.